Cahors on the Le Puy Camino and is considered to be the most beautiful city of the way. Le Puy Way is the most popular of the Camino routes in France and covers a distance of 713km from Le Puy en Velay to St Jean Pied de Port at the foot of the Pyrenees. 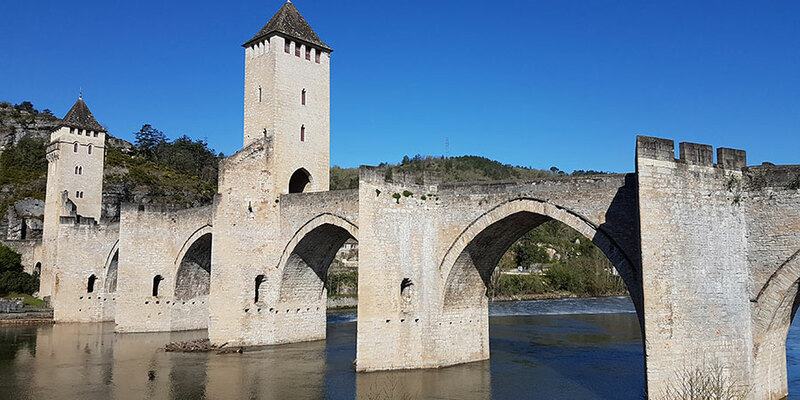 Cahors itself sits in the centre of a bend in the River Lot meaning the town is surrounded on three sides by water and steep limestone cliffs.The area was originally inhabited by a Celtic tribe known as the Cadurci before Roman conquest in the 50’s BC. The town quickly grew to be an important centre of Roman governance and trade. The town was mentioned in Dante’s Inferno as being wicked due to the fact that the local bankers at the time charged interest on their loans. This was an uncommon practice in those times. Easily the most notable attraction in the town is the Valentré Bridge. The bridge is a six arch stone structure which was opened in 1350 and with its fortified towers it holds its place as one of the iconic images of the town. There are a number of buildings and sites on Le Puy Way which have been designated as UNESCO World Heritage Sites under the umbrella of the pilgrimage trail to Santiago de Compostela and the bridge is one such structure. There is a legend about the bridge which suggests that the architect sold his soul to the devil in order to help him finish the construction. The legend is reflected in the small devil statue on the centre tower which was placed there during a more recent renovation. Cahors Cathedral is a National Monument which was built in the 11th century. It is an unusual design, with the sturdy walls making the cathedral resemble a castle. The cathedral has a wonderful 16th century cloisters which houses renaissance frescoes and paintings. There is also an alter in the Cathedral which holds what is said to be a relic of the Holy Cap of Christ. Around the town there are an abundance of wonderful buildings from the 13th, 14th, 15th and 16th centuries, giving this town a real medieval feel. Due to the importance the town held during Roman times, there are a number of remains from that time too. Pope John XXII was born in Cahors in 1249 and he was the second of the Avignon Papacy to be based in France rather than Rome. The area is renowned for its ‘black’ wine which has been made since the Middle Ages. This wine is thought to be the darkest in the world, while it is also some of the richest and strongest. Along with its wine, the area is renowned for its duck, black truffles, foie gras and hearty beef stews. A local custom is called faire chabrot and it involves pouring wine into a bowl with a small bit of soup left in it and then drinking from the bowl.